One thing that I've noticed with Canon DSLR camera is they will disable or limit autofocus when the lens' maximum aperture is narrower than certain values, which are specified in my answer to What apertures are required to enable autofocus, including cross-type or high-precision focusing, on Canon DSLR cameras? Note that Nikon cameras are also typically limited to f/5.6 except for models featuring the latest revision of the Multi-CAM 3500 AF system as in the D4 and D800. As far as I am aware, Olympus and Pentax do not have these limitations, even if autofocus may be slow or unreliable beyond f/5.6. (Sony/Minolta requires at least f/6.3, with one exception for a 500mm f/8 autofocus mirror lens, and the Alpha 850 and 900 have a center AF point with high precision at f/2.8.) For example, on Pentax, 9 of the 11 points are cross-type and remain so at all apertures. The Pentax AF system has been reported to work at f/8 and beyond, though extremely slowly. Olympus Four Thirds cameras will continue to attempt to focus below f/5.6 as well. Why do Canon and Nikon choose to limit AF functionality instead of attempting to focus with reduced performance beyond the above cutoffs? The auto focus systems are not capable of using the highest precision cross type focusing points if you do not use a large aperture lens. They aren't artificially limiting the precision, they are simply working within the constraints of the maximum aperture. Canon puts these limits in to ensure reliable AF. If you don't believe that theory, add a piece of tape between your teleconverter and lens, on the top three left pins. This will trick your body into thinking that you don't have a teleconverter attached, and your lens is simply a 300/4.0 or whatever you have. This really comes down to a issue of user experience. Sure, they could include ISO 204800 or 409600, but the quality would not make anyone happy. They are trying to keep the majority of users satisfied with what the camera can do, and most consumers are satisfied if AF doesn't hunt endlessly. 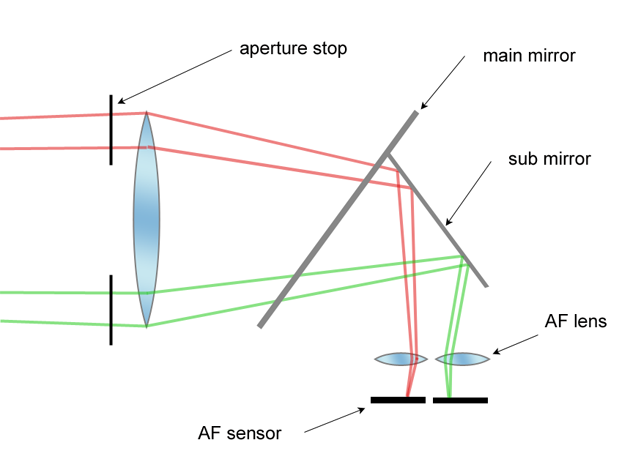 Aperture limitations are a consequence of the design of phase detect autofocus systems and are not specific to Canon. The size and separation between the pair of AF sensors determines the accuracy of the AF measurement. However there is a trade off - the further apart they are, the wider the aperture must be in order to direct light to reach both sensors. In the diagram I have included an aperture stop that represents, say f/4.0 (the lens is f/2.8 wide open). With the lens stopped down to f/4.0 incoming light would be blocked from reaching the AF sensors. Modern AF units have multiple AF points, each composed of a pair sensors at different separations and orientations. The centre point often has an extra wide separation sensor pair and thus only works at maximum accuracy at f/2.8. Often AF points have pairs of 1D pixels at 90 degrees in order to detect either horizontal or vertical detail. One pixel row will have greater separation so the AF point only works as a "cross type" sensor when using a large aperture lens, otherwise either the vertical or horizontal sensor is disabled, leaving a regular single-orientation AF point. The sensors may work a bit past their specified aperture, as the pattern of light might overlap the sensor just enough to get a match and calculate the distance, which is why taping the pins of a teleconverter sometimes works. But in general it's not designed to do this so to prevent inaccurate or intermittent performance, Canon disable AF when the reported aperture is too small. Canon has optimised their AF units to be very accurate with wide aperture lenses (which Canon offers at even long focal lengths, for example the 400mm f/2.8 or 600mm f/4.0), rather than to be more flexible continuing to work but with less speed and accuracy at small apertures. Not the answer you're looking for? Browse other questions tagged canon aperture autofocus or ask your own question. What's the difference between cross-type autofocus points and regular ones? Buying a Nikon DSLR Camera body only, is a 35mm and 55-200mm lens enough for most cases? Why am I able to set wider aperture than my lens technically allows? What is the Autofocus type in Nikon D3300? Does processor affect auto-focus precision?